Dushanbe (Tajik: Душанбе, Dushanbe; formerly Dyushambe or Stalinabad), population 661,100 people (2006 census), is the capital and largest city of Tajikistan. The city has an Islamic heritage. Its citizens are mainly Tajiks, and Tajik is the main language. With the rest of Tajikistan, Dushanbians share culture and history with the neighboring Iranian people. Located at the confluence of the Varzob and Kafernihon rivers, Dushanbe was a small village until the early twentieth century. As part of the Soviet Union, the central government transformed the area into a center for cotton and silk production. Tens of thousands of people were relocated there. In 1924, the city was chosen to serve as the capital of the Tajik Autonomous Soviet Socialist Republic. Dushanbe was a peaceful and relatively prosperous city under Soviet rule; but suffered from severe rioting in 1990. From 1992 to 1997, the city was badly damaged as a result of civil war which began shortly after Tajikistan gained independence on September 9, 1991. At the beginning of the twenty-first century, Dushanbe, along with Tajikistan, continued to struggle from the after-effects of Soviet occupation and civil war. Tajikistan was poorest nation in the Soviet sphere. Today, it is challenged by corruption, weak governance, widespread unemployment, seasonal power shortages, an external debt burden, and serious environmental problems resulting from the agricultural and industrial policies employed under Soviet rule. Active measures are required to overcome political corruption and to ensure economic growth and stability. Assistance from the international community has brought some relief through increased economic development and security assistance. The name Dushanbe is derived from the Persian word for "Monday," in which du means two, and shamba or shanbe means day (literally "day two",دوشنبه), and refers to the fact that it was a popular Monday marketplace. Situated on the confluence of two rivers, Varzob and Kafernihon, at an elevation of 2,316 feet (706 meters), Dushanbe's location was once famous for its market. Dushanbe's climate is damper than other Central Asian capitals, with an average annual rainfall over well over 20 inches (500mm) but is still highly continental and has the hot, dry summers typical of the region, mitigated by mountain breezes. Winters are not as cold as further north owing to the shielding of the city by mountains from extremely cold air from Siberia. The average maximum daytime temperature in January of 44.6°F (7°C), rising to an average maximum of around 95°F (35°C) in July. In addition to earthquakes, environmental issues include inadequate sanitation and industrial pollution. Despite the nation's potential as a hydroelectricity generator, power supply is intermittent. Dushanbe, which is a planned city with wide, straight, tree-lined streets, several squares and parks, and with low, one-story buildings, is divided into four administrative zones: Rah Ahan, Markazi, Oktiabr, and Frunze. Varzab, a suburb of Dushanbe, once served as a prominent recreation area for the former Soviet Union. Although archaeological remnants dating to the fifth century B.C.E. have been discovered in the area, there is little to suggest that Dushanbe was more than a small village until the early twentieth century. Records show that as early as 1676, on every Monday, villagers from the surrounding areas brought their produce to market at this spot. "Dyushambe" belonged for a long time to the khanate of Bukhara. In 1920, the last Emir of Bukhara briefly took refuge in Dyushambe after being overthrown by the Bolshevik revolution. He fled to Afghanistan after the Red Army conquered the area the following year. With the Red Army victory and coming of the railroad from 1929, the city became the capital of the Tajik Soviet Socialist Republic. In 1929, the city was renamed "Stalinabad," after Soviet leader Joseph Stalin (1878-1953). The city was renamed "Dushanbe" in 1961 as part of the next Soviet leader Nikita Khrushchev's de-Stalinization initiative. The Soviets transformed the area into a center for cotton and silk production, and relocated tens of thousands of people to the city from around the Soviet Union. The population also increased with thousands of ethnic Tajiks migrating to Tajikistan following the transfer of Bukhara and Samarkand to the Uzbek SSR. A peaceful and relatively prosperous city under Soviet rule, severe rioting occurred in 1990, after it was rumored that Moscow planned to relocate tens of thousands of Armenian refugees to Tajikistan, which spurred local nationalist sentiment. The city was badly damaged as a result of the Civil War in Tajikistan (1992–1997) that sprang up in the nation shortly after its independence, on September 9, 1991. Since that time resurgences in the Tajik economy have transformed Dushanbe into a rapidly growing commercial, cultural and industrial center. Many multi-story apartment and office buildings were constructed and the city was beautified during this period. Monuments and statues commemorating the city's Persian and Iranian past were erected. The Dushanbe synagogue, which was constructed in the early 1900s in one of the two Jewish Quarters in Dushanbe at the time, was used by the Jewish community there until February 2006, when the government demolished it to make way for a new presidential residence, the "Palace of Nations." Tajikistan is a republic in which the president, who is head of state and Supreme Assembly chairman, is elected by popular vote for a seven-year term, and is eligible for a second term. The prime minister, who is head of government, is appointed by the president, as is the Council of Ministers. The bicameral Supreme Assembly, or Majlisi Oli, consists of the National Assembly (upper chamber) or Majlisi Milliy, consisting of 34 seats, of which 25 members are selected by local deputies, eight are appointed by the president, and one seat is reserved for the former president, all to serve five-year terms, and the Assembly of Representatives (lower chamber), or Majlisi Namoyandagon, which comprises 63 members elected by popular vote to serve five-year terms. 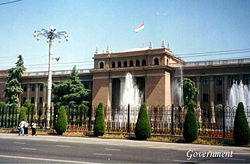 Dushanbe is capital of Tajikistan, and the administrative center of the Region of Republican Subordination, formerly known as Karotegin Province, one of the nation's four regions. Each region is divided into districts (raion or nohiya), which are further subdivided into jamoats, and then villages (qyshloqs). 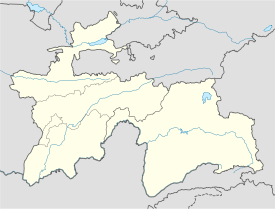 Tajikistan has a total of 59 districts. Executive authority of the city is represented by the city Khukumat headed by Mayor. 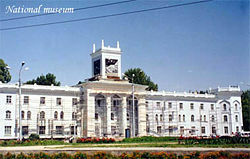 Dushanbe Airport during renovations in 2007. Tajikistan has one of the lowest per capita GDPs among the 15 former Soviet republics. Only 7 percent of the land area is arable. Cotton is the most important crop, but this sector is burdened with debt and an obsolete infrastructure. The civil war (1992-1997) severely damaged the already weak economic infrastructure and caused a sharp decline in industrial and agricultural production. Tajikistan ranks third in the world in terms of water resources per head, but suffers winter power shortages due to poor management of water levels in rivers and reservoirs. Tajikistan's per capita GDP was estimated at $1,800 in 2007. Coal, lead, and arsenic mined nearby in the cities of Nurek and Kulob allowed for the industrialization of Dushanbe, which accounts for much of Tajikistan's industrial output. The Nurek Dam in the city of Nurek, the world's highest hydroelectric station, provides 95 percent of Tajikistan's electricity, and another dam, the Roghun Dam, is planned on the Vakhsh River. A leading cotton textile center, Dushanbe also produces silk, machinery, automatic looms, electrical appliances, domestic refrigerators, clothing, leather goods, tractor parts, and foodstuffs. The city of Dushanbe is now home to a number of modern telecommunications, aeronautic and other business corporations. Tourism and ecotourism, to the beautiful natural scenery throughout the Dushanbe area, is now a component of the burgeoning service industry, which includes world-class shopping centers, cafes, restaurants and hotels in the city's economic center. Cultural and ethnic Museums and Theatres add a cultural element to the economy. Dushanbe has two main bazaars: Barakat and Shamansur. During the summer, the bazaars teem with vegetables, fruits, flowers, and people, while in winter, they are all but deserted. Dushanbe is an important transport junction. There is a rail connection to Termez and Tashkent in Uzbekistan, and a road connection to Kulab, Qurqanteppe, and Khorog, the administrative center of Gorno-Badakhshan. Low access to cars means public transport, mostly buses and trolley-buses, carries 89 percent of all passengers. Due to the mountainous terrain of the region, travel by plane and helicopter often is preferred to travel by car. Passenger traffic runs mainly through the Dushanbe airport to Khojend, Khorog, Korghan Tube, and international destinations. Dushanbe had a population of 661,100 people in 2006. Tajiks made up 79.9 percent of Tajikistan's population in 2000, Uzbeks 15.3 percent, Russians 1.1 percent, Kyrgyz 1.1 percent, and others made up 2.6 percent. Tajik is the official language, while Russian is widely used in government and business. Sunni Muslims made up 85 percent of the population in 2003, Shi'a Muslims 5 percent, and others 10 percent. Dushanbe is the location of the Tajik State National University, which emphasizes history, philology, and economic planning, the Tajik Academy of Sciences, medical, teacher-training, agricultural colleges, and a polytechnic institute, which offers training in energy, architecture, and mechanical engineering. Also in the city is the School for Deaf and Mute, which is a special art and social sciences school for students with limited hearing and speaking ability. 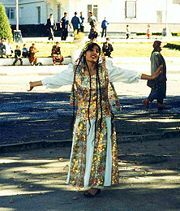 A Tajik traditional dancer entertaining passers-by on the streets of Dushanbe, 2007. The Gurminj Museum of Musical Instruments, which was founded in 1990 by Gurminj Zavkibekov, a Tajik actor and musician, has about 100 musical instruments on display, including string instruments as tor, rubab, Pamiri rubab, tanbur, dutor, setor, qashqar, and ghizhak, as well as a number of drums such as thye tabl, daf, and doyra. 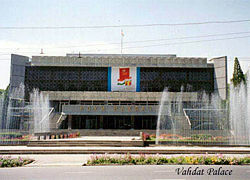 The Palace of Unity, also referred to as Vahdat Palace, which is the headquarters of the ruling People's Democratic Party, and is also used to host international conferences. Dushanbe Zoo, which was founded in 1960, had 1059 animals related to 254 species of global fauna in 1974, and was regarded as one of the best in the Soviet Union. Finance dried up after independence in 1991, reducing the number of animals in captivity to 600. The Symphonic Orchestra of Dushanbe, which is Tajikistan's main Persian Symphony Orchestra. As capital city, Dushanbe faces the problems that Tajikistan faces. Since independence in 1991 following the break-up of the Soviet Union, Tajikistan was in 2008 in the process of strengthening its democracy and making a transition to a free market economy after its 1992-1997 civil war. Challenged by corruption, weak governance, widespread unemployment, seasonal power shortages, and an external debt burden, the country remains the poorest in the former Soviet sphere. However, attention by the international community in the wake of the war in Afghanistan has brought increased economic development and security assistance. Geocities. Welcome to Dushanbe Retrieved September 20, 2008. The World Bank. Tajikistan transport Retrieved September 20, 2008. World Fact Book. 2008. Tajikistan Retrieved September 20, 2008. This page was last modified on 6 October 2017, at 16:37.